I received this book for free from Simon & Schuster Audio in exchange for an honest review. This does not affect my opinion of the book or the content of my review. From the moment they meet in a darkened cell, Jaxon craves her touch. But the machine half of Le'Ace forces her to do things she doesn't always want to do. Even betray him...and ultimately destroy him. Now Jaxon must battle the man controlling Le'Ace, and even Le'Ace herself, to at last claim the woman he's come to love. 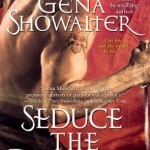 Savor Me Slowly by Gena Showalter is the third book in the Alien Huntress series. This story features Jaxon Tremain and Mishka Le’Ace. Jaxon is an agent through and through and despite incomprehensible torture, refuses to discuss his case with his captors. Then along comes Le’Ace to free him. Unfortunately, she is after the same info his original captors were after and it is hard for Jaxon to determine just who Le’Ace is playing for. Le’Ace is half human, half machine and her every move is controlled by someone else. She must do things to save herself that make her look like the definite bad guy in her lifetime, but no one knows the real reason behind the cold, calculating Le’Ace. Until Jaxon that is. Le’Ace opens up to him about her circumstances and Jaxon desperately wants to help her, as well as close the case they both seem to be working on. I liked Jaxon and his determination to go with his gut despite the warnings and threats from his friends and fellow agents. After learning of what Le’Ace has been going through her whole life, you feel compassion for her, and just want to yell at Jaxon’s friends to back off. The narration was a bit hard for me to get used to. I had never heard any of Justine Eyre’s work before and was kind of on the fence with her male voices. Eventually the story picked me up and carried me away and I no longer was bothered by the narration at all. 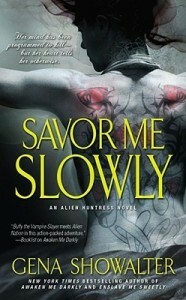 I enjoyed Savor Me Slowly even without reading the first two books. The couples from the previous books do have roles in this one, but you don’t feel like you missed too much. Saying that, I will go back and listen to the first two now. I am curious about those relationships and want to see how they are built. Also, I do not have a great grasp on the world yet, and think I need to read the previous books to hopefully wrap my head around the different species of aliens. I want to give Justine Eyre another shot too. I think once I’m used to her accents, etc. 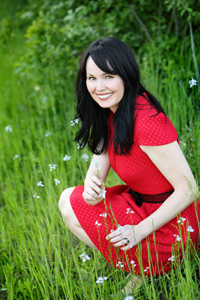 she could be one of my go-to narrators.